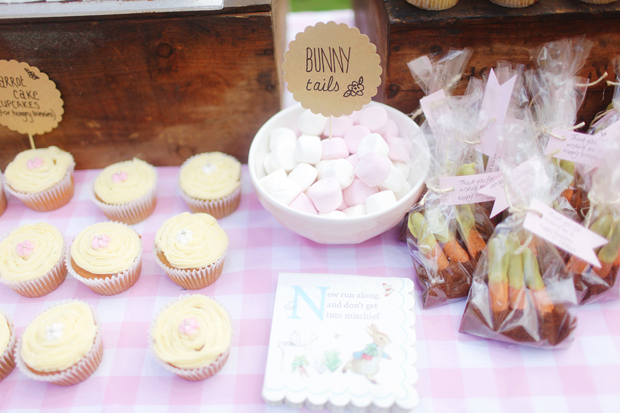 Before I was even pregnant I knew our child would be having a Peter Rabbit first birthday party. Yes, I am that person. My love for all things Beatrix Potter runs deep, I do dream often of retiring to a thatched roofed cottage in the lakes district in England (and Beatrix is still a favoured girls name, husband is yet to jump on that bandwagon though, working on it). 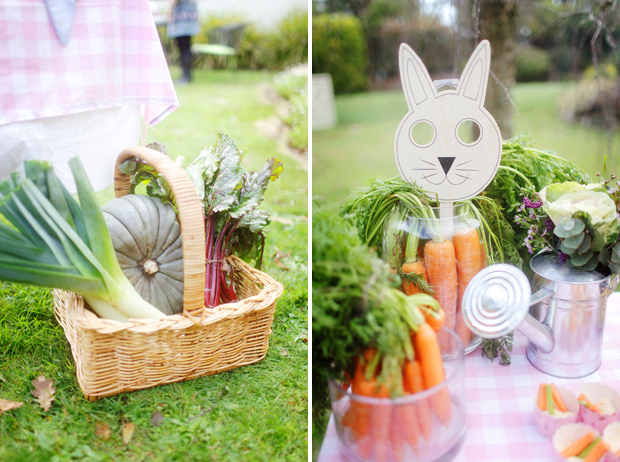 As I’d always imagined that our firstborn would be of the male bunny variety though…plans looked a little different! 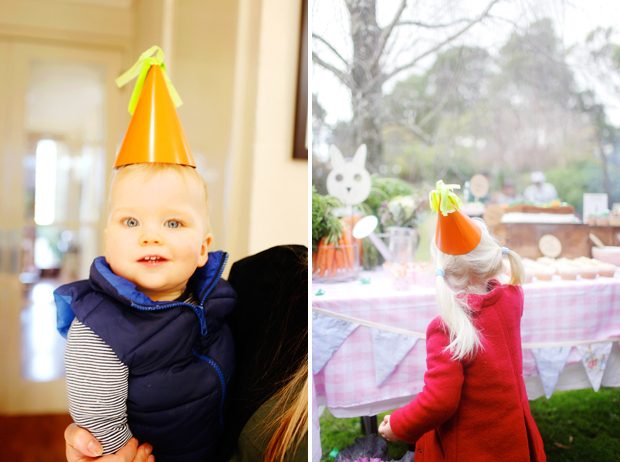 But a Peter Rabbit soiree with touches of pink ended up being the perfect celebration for our little bunny’s first birthday. 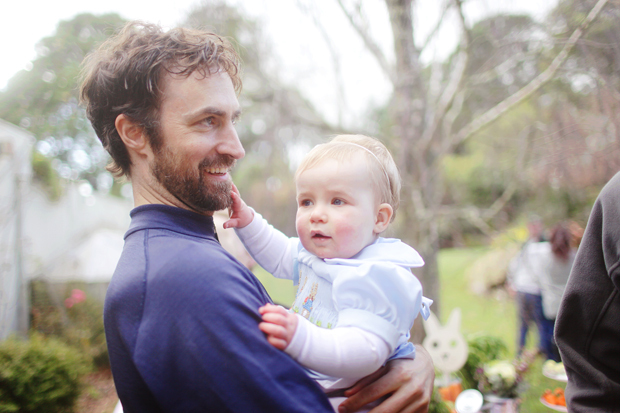 Being a June baby in Gippsland, weather will always be a consideration with Eleanor’s birthday (whose idea was it to have a Winter baby?!) Our ‘cosy’ farmhouse simply couldn’t accommodate people if it rained, which was more than likely. 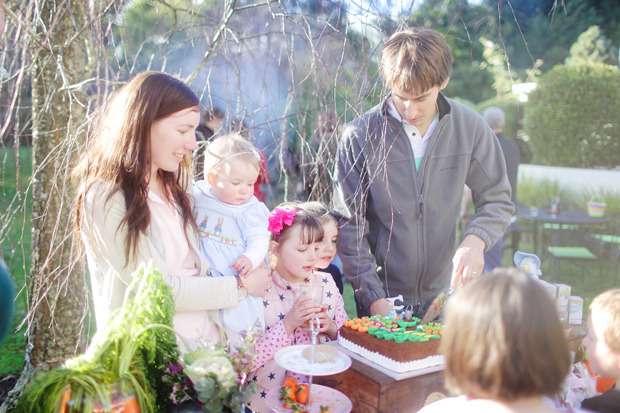 So the decision was made early to have the party at Grandi’s house – our big family home with sprawling garden, tennis court for the older kids to ride their bikes, enough plates and glasses to feed the masses and where all of our special family events centre around. 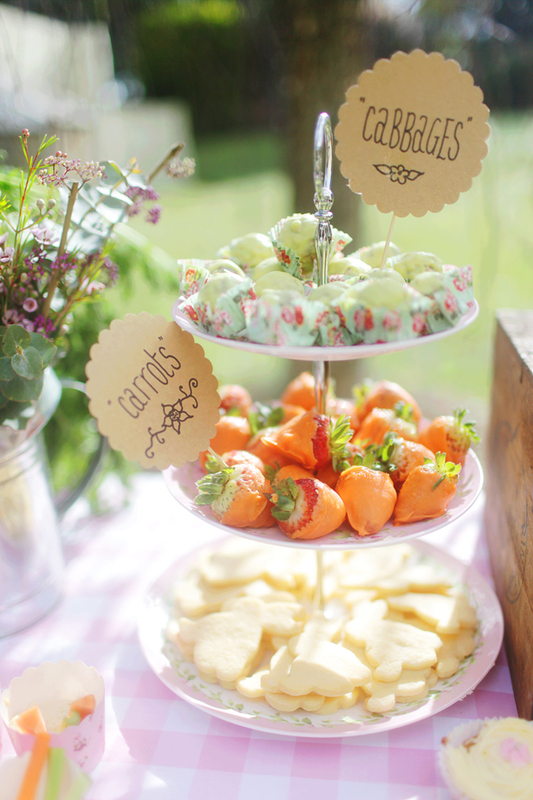 With the venue sorted I set to creating some simple decorations, sticking to my Peter Rabbit colours of blue and tan with pink as well to point out the obvious, that Eleanor was a girl! 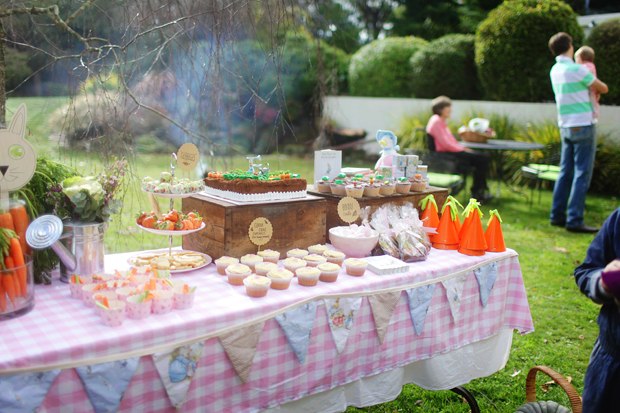 Using pink gingham cotton I made some simple tablecloths to give a sweet country picnic feel, and using Spotlight’s Peter Rabbit quilting fabrics I made bunting to hang across the front of the party table. 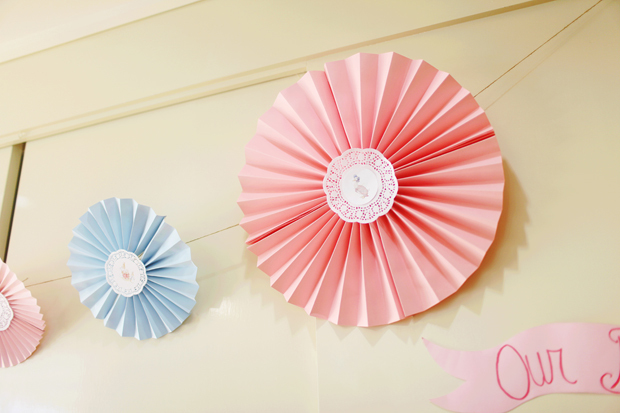 For my baby shower I had done tissue paper pom pom’s so I wanted to do something different for Eleanor’s birthday. 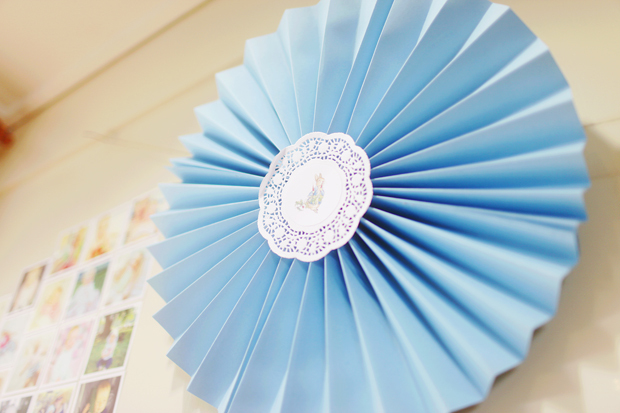 Using 2 x A2 sheets of cardboard I made accordion fold fans, which I then attached white paper doilies to and printed illustrations of Peter Rabbit, Jemima Puddleduck, Mother Rabbit and Flopsy, Mopsy and Cottontail. 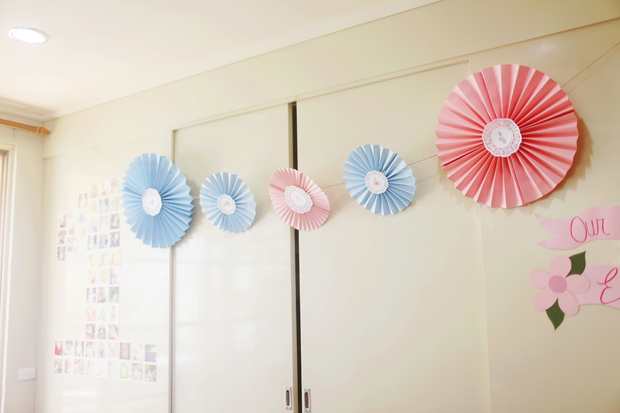 I had grand illusions of a wall covered in these fans, overlapping each other, but I quite simply ran out of time and effort to create them en masse. 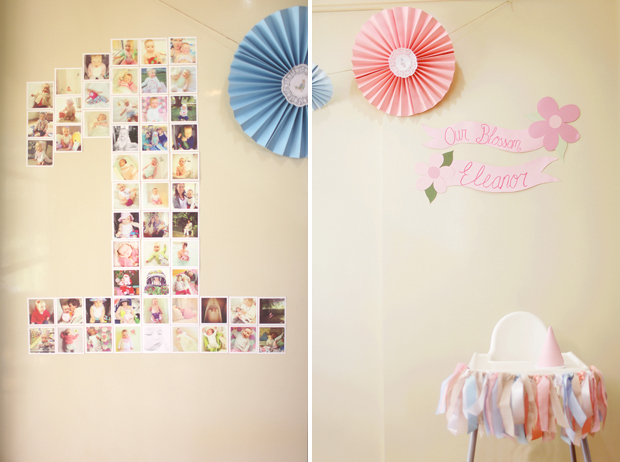 Also on the wall we created a giant ‘1’ out of all my favourite Instagram photos of #ourblossomeleanor over the past year. It was lovely to look at just how much she’s grown, special moments with special people in her life – just born in the hospital with Grandi, splashing in the pool in Fiji with Daddy, giggles with cousins galore. 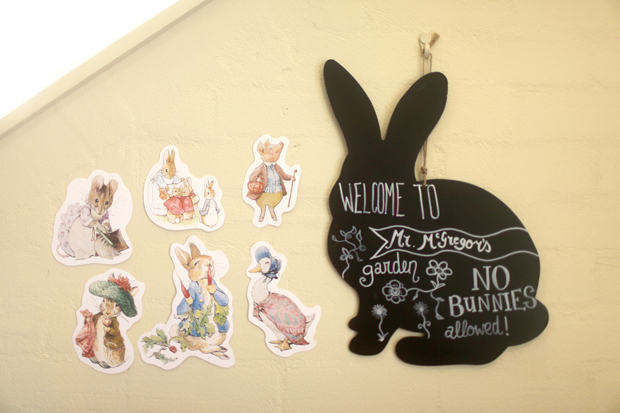 Some classic illustrations of Peter Rabbit characters also adorned the walls, along with a bunny shaped blackboard with a stern message from Mr McGregor! I made a simple, but effective, highchair skirt for Eleanor’s Ikea Antilop just using a piece of elastic which stretched around the highchair and then had pink, blue and tan gingham and plain satin ribbons tied to it. 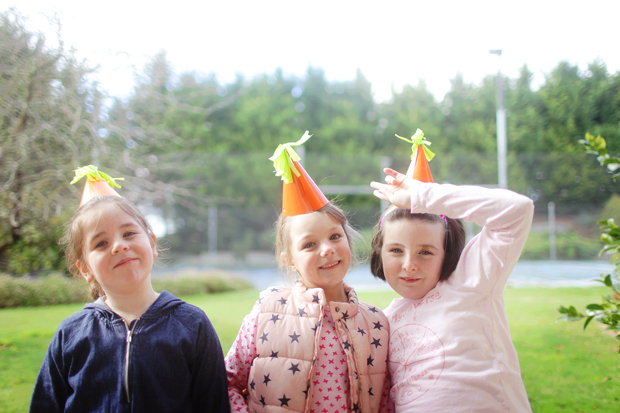 Eleanor’s party hat was simply covered in pink gingham fabric and white mini pom pom trim, but unfortunately the elastic broke so it stayed on her head for about 0.2 seconds of it’s own accord! (Not that she probably would have kept it on anyway…) I made banners and flowers out of cardboard and painted ‘Our Blossom Eleanor’ to make for a great photo opportunity of the birthday girl getting into some cake! 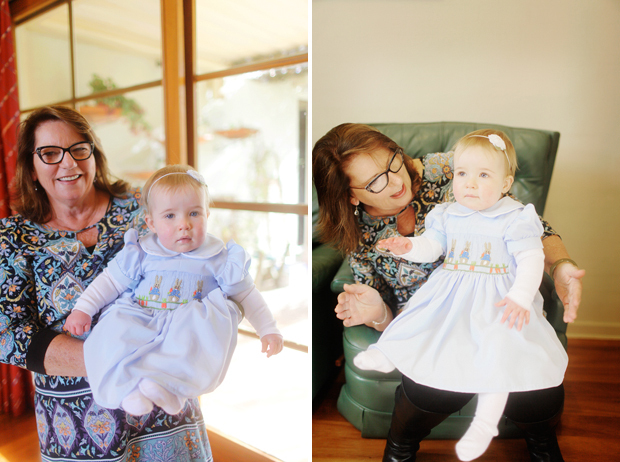 Eleanor’s beautiful party dress was made with love by my mum – Super Grandi. 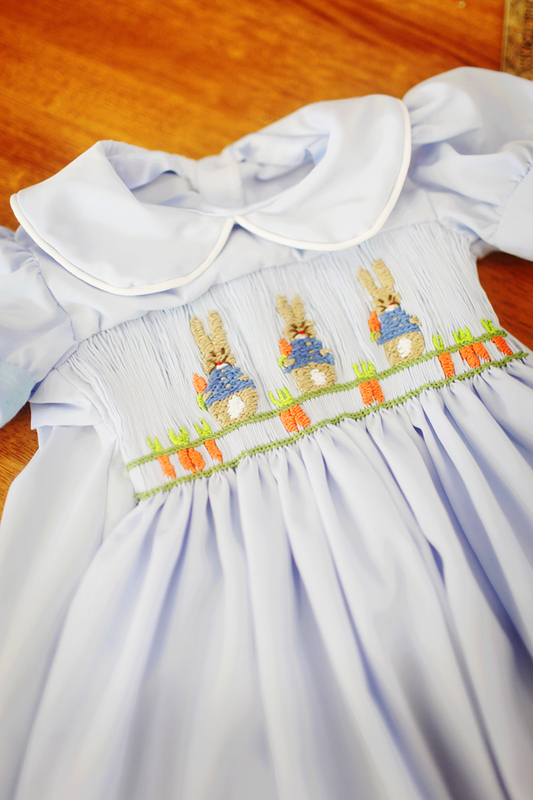 I wanted a classic, smocked dress with Peter Pan collar for her in a Peter Rabbit soft blue. Grandi, as she does, said “I’ll make it!” Of course she would. Not having smocked since I was a baby, she did an amazing job, taking the project with her on the road on her recent adventure to Uluru and back. 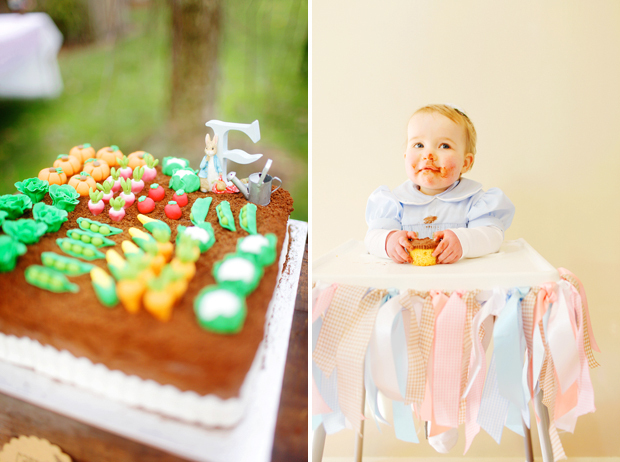 The smocking had the perfect finishing touches of embroidered rabbits and carrots in the ground, beautiful details which were perfect for our little bunny. Our friends gave Eleanor a beautiful Jemima Puddleduck pull along toy when she was born (knowing my deep Beatrix Potter love!) which actually became the inspiration behind the party. 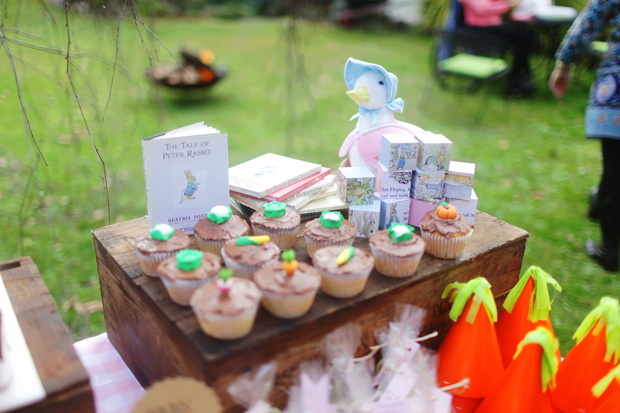 Jemima had been sitting pretty on the shelf in Eleanor’s room all year, but came out to sit on her party table alongside the blocks I made (see how to make them here) and my friend Jen’s sweet set of vintage Peter Rabbit books. As Eleanor learns to walk (not anytime soon!) I think Jemima needs to be used, not just left on the shelf. 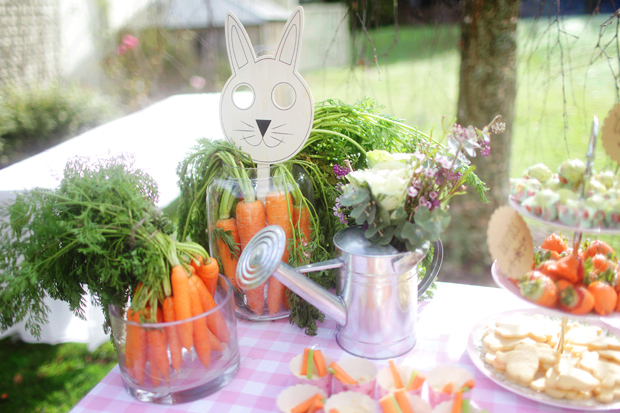 Carrots were the order of the day for all of the mischievous bunnies (we had 18 children at the party!) 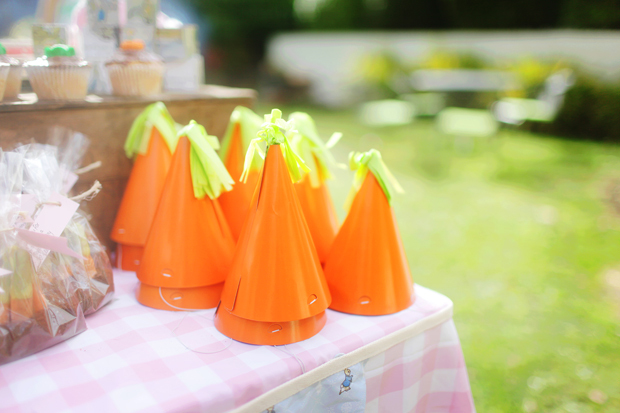 I made orange party hats into ‘carrots’ with some frayed green tissue paper tops and also had big bunches of organic carrots spilling out of glass vases. I spied some ornamental kale in a local nursery and potted them in our tin planter, and had a homegrown pumpkin, organic beetroot and leeks displayed in a wicker basket by the party table. 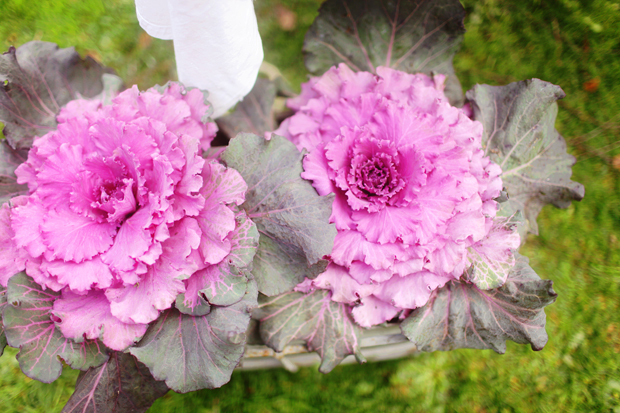 I also had an ornamental kale flower arrangement displayed in a little galvanised watering can, which Eleanor will use now to water our own real veggie patch. For sweet treats I made carrot cake cupcakes with cream cheese icing, strawberries dipped in orange chocolate (‘carrots’), green chocolate coated Fererro Rocher’s (‘cabbages’), bunny shaped biscuits, marshmallows (‘bunny tails’) and carrots and celery sticks with hummus, all with hand drawn signs on kraft card. 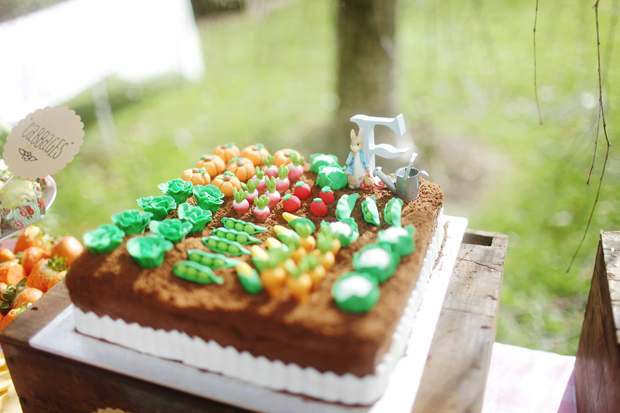 A veggie patch cake was always on the cards for a Peter Rabbit party – but I quite simply didn’t have the time, skill or inclination to make the intricate fondant vegetables! I think I contemplated it for about a minute…before jumping online and investigating possibilities. I have always said that I would make all of our children’s birthday cakes, I didn’t want fancy bought ones, I wanted ugly looking slapped-together-but-damn-it-mummy-made-it cakes! So I made my favourite no-fail chocolate cake in a big square, with chocolate buttercream icing and crushed chocolate ripple biscuits as the ‘dirt’ and convinced myself it was ok to outsource the fiddly part! Sometimes you just need to know when to call in the troops. Matt actually iced the cake and did the ‘dirt’ so I basically only did the cooking part, perfectionist Daddy was far better suited for the ‘important’ bits. 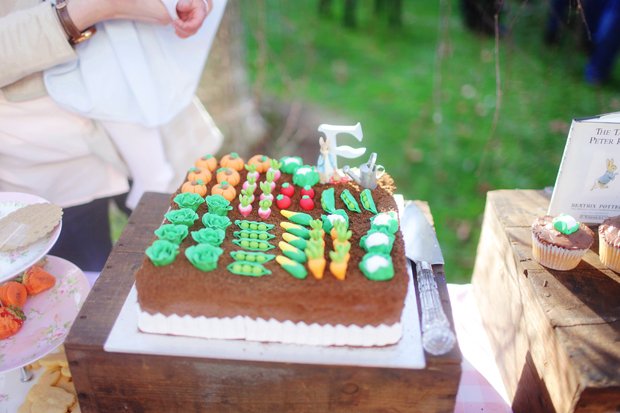 I did however make the white picket fence (which had wood grain pattern in it…somewhere) so I kept telling people when they were ooh-ing and aah-ing at the cake “Yes, but look at the FENCE!” Ha! I had leftover fondant veggies though as I totally over-ordered, always with the mindset that ‘more is more’, so on Saturday morning I quickly whipped up some individual cupcakes with leftover buttercream icing to have as well. 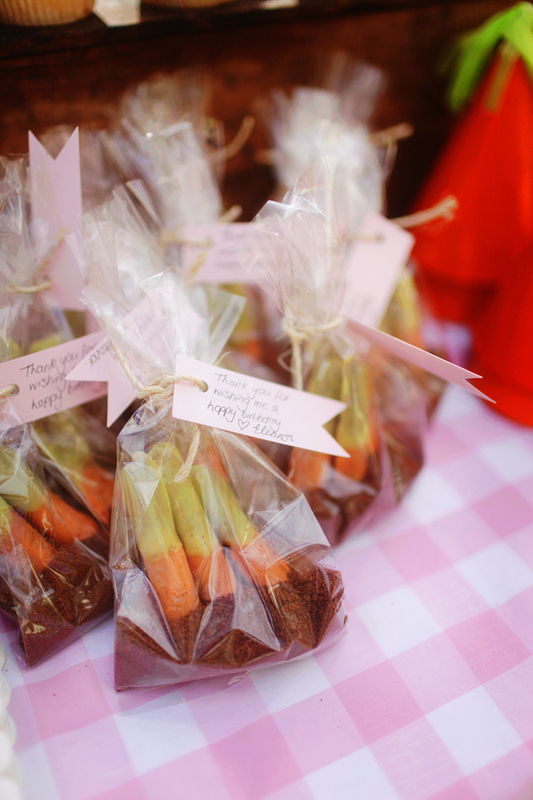 Little guests could take home their very own ‘carrots in dirt’ – I made little favour bags filled with crushed chocolate ripple biscuits and chocolate wafer sticks dipped in orange and green chocolate melts. 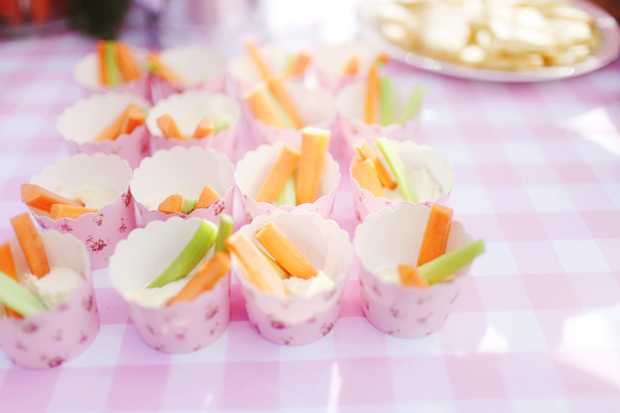 Carrots in dirt! 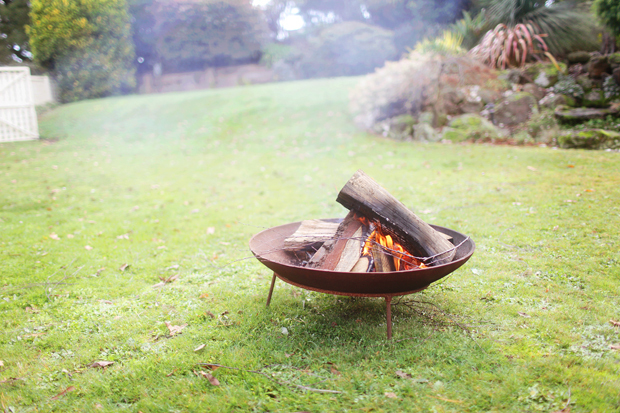 We served a barbeque lunch with salads, keeping people warm by Grandi’s firepit in the backyard. 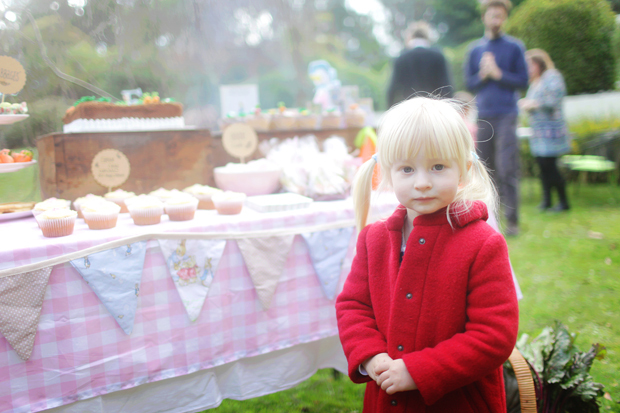 Despite my ‘strictly no gifts’ instructions, most people completely ignored me! 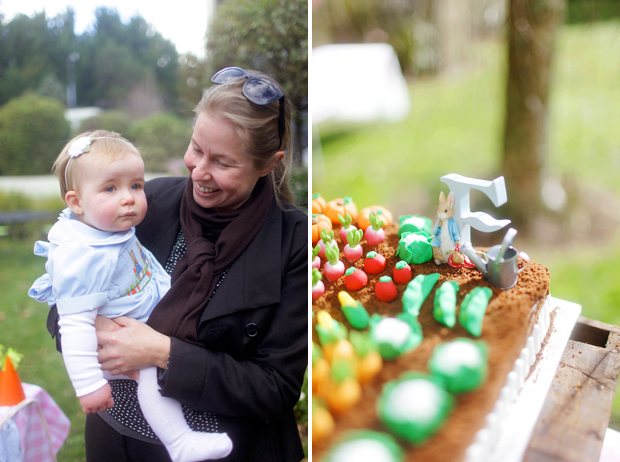 Eleanor was showered with lots of lovely gifts – wooden puzzles and books mainly, perfect. 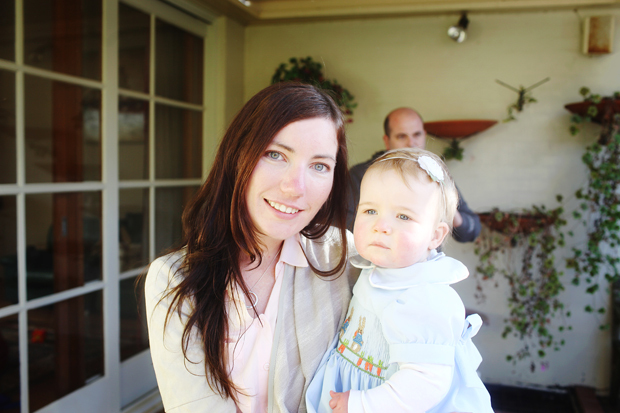 Our blossom was suitably celebrated and loved upon all day, passed from aunty to uncle to grandparent and friend. 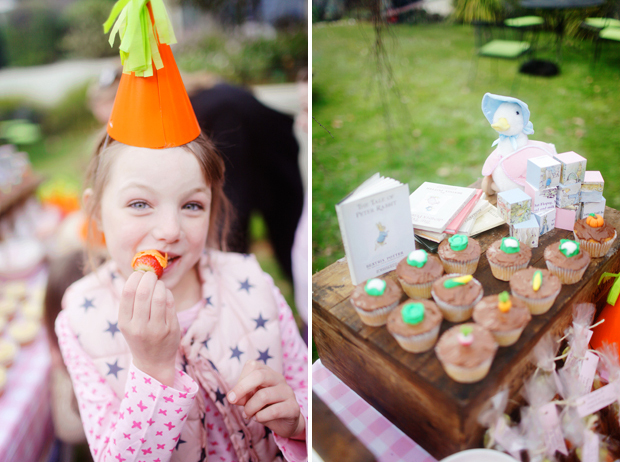 Of course she hardly slept all day, but whilst there was party excitement to be had the party girl was awake! As I knew would be the case, she hardly smiled for the camera all day, was far too intent on taking everything in, not quite sure what to make of all the people ooh-ing and aah-ing over her. Fair enough, Blossom. Always our contented quiet little observer. Fondant veggies: Cookie Cookie Yum Yum, Smocked dress: made by Grandi, Headband: AnK Bowtique, Rabbit blackboard: Kmart, Instagram prints: Sticky9, Ornamental kale flower arrangement: Flowers by Rhi, Galvanised watering can: Bunnings, Organic carrots, leeks, beetroot, kale: Thorpdale Organics. 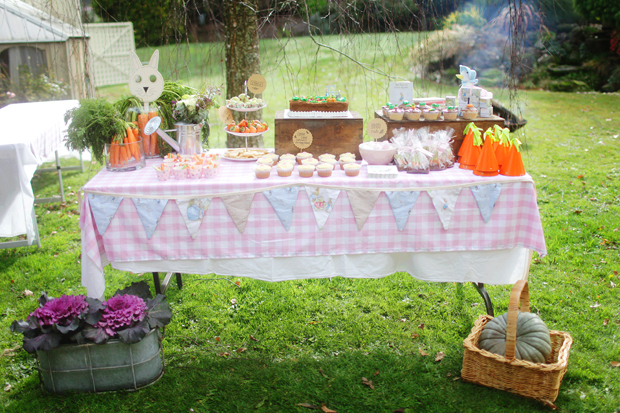 Pink gingham cotton for tablecloths, pink and blue card for fans, paper doilies, card for ‘Our Blossom Eleanor’ banner and flower cut-outs, ribbons for highchair skirt, party hats and tissue paper for ‘carrots’ hats, favour bags, orange and green candy melts, cake board, vase for carrots, Peter Rabbit fabric for bunting, rabbit mask – all kindly supplied by Spotlight. This is just gorgeous! I love it! 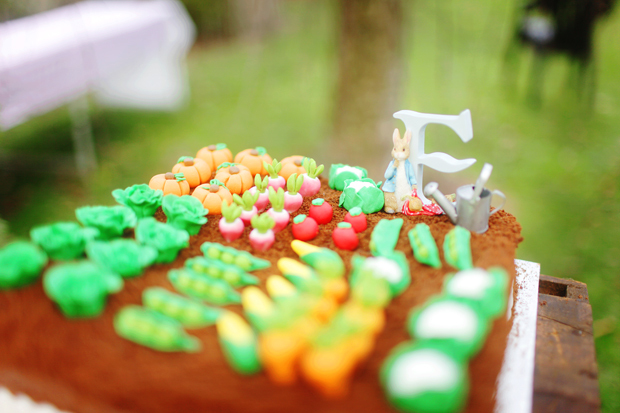 I got roped into making the fondant vegetables for the veggie patch cake…much easier to outsource that bit!! I’m so glad the weather held out for you. 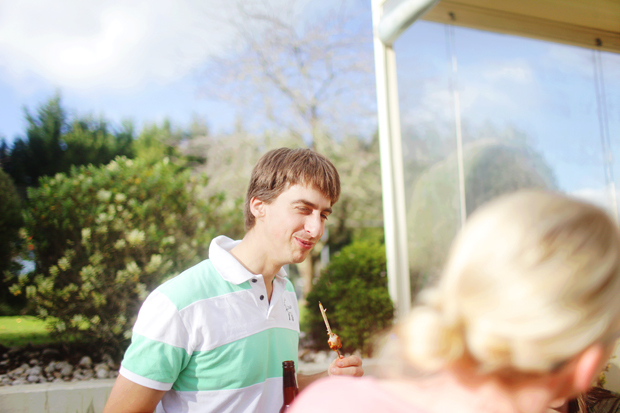 I was so paranoid for my sons first birthday party (he’s 14 now) I called the Bureau of Meteorology that morning and spoke to a lovely meteorologist who was more than happy to give me his weather predictions for the day. And he was precisely spot on! And very patient to a mildly panicking new mum. 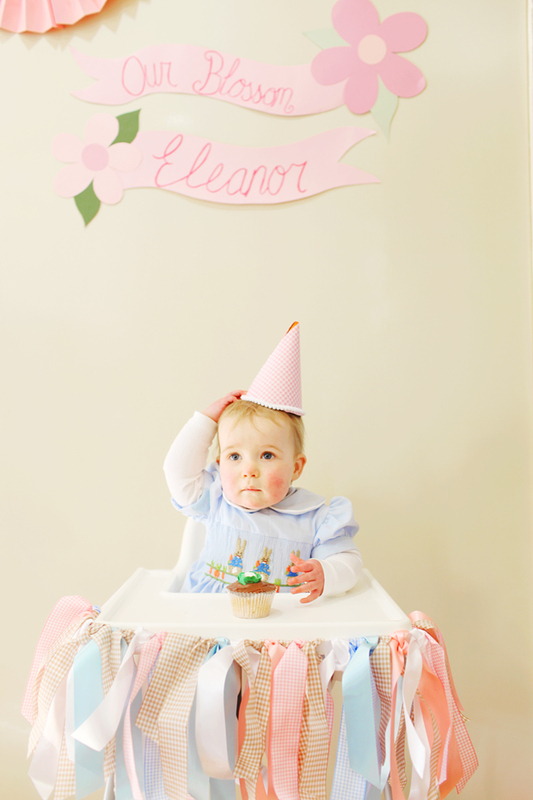 Happy Belated Birthday little Eleanor! The day looks like it was perfect Emma. We are about to celebrate out little girls 1st Birthday in a months time. I think that i am driving my husband mad trying to decide what cake to make. Would you be interested in sharing your chocolate cake recipe. I need to make one to feed many!! Thankyou so much Emma!! I really appreciate you replying. Matey you are a pro!! 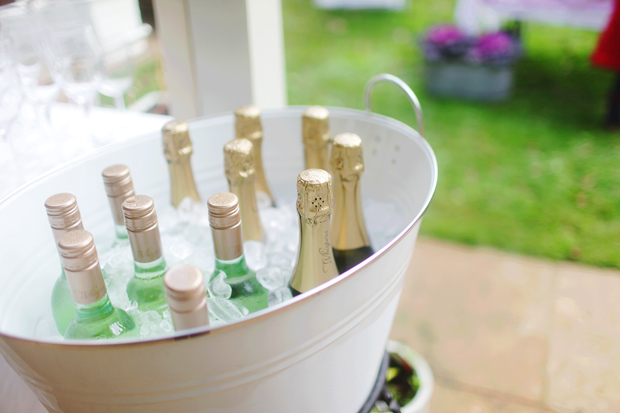 Id hire you for party decorating any day. 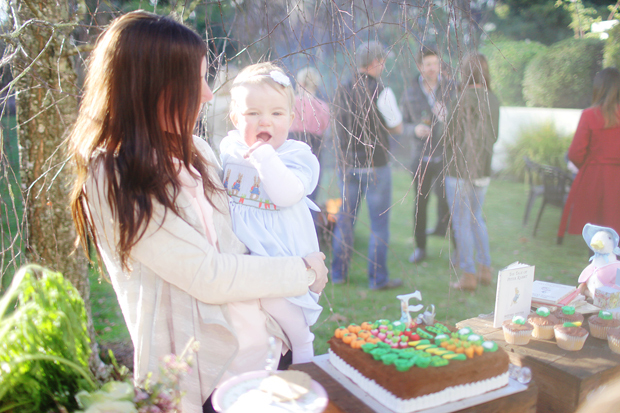 What a lovely party, decorations and such a little sweet pea in Eleanor. Have you discovered Peter Rabbit on ABC4 kids yet? Cracker show!! 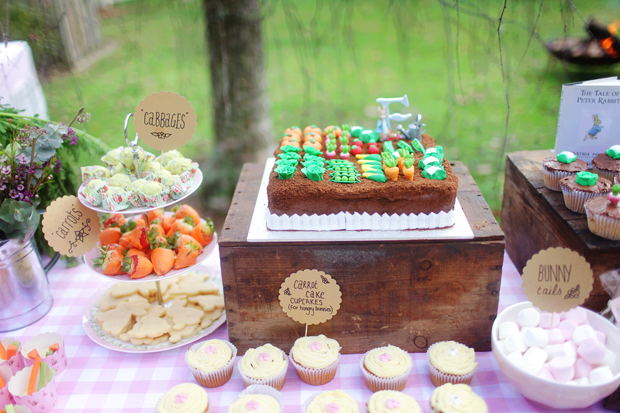 Ive got my sons 4th bday and I’m struggling to even think about a party….You have motivated me though for the cake part. So nice to have pics as memories of it all. Hop to it then I go…. 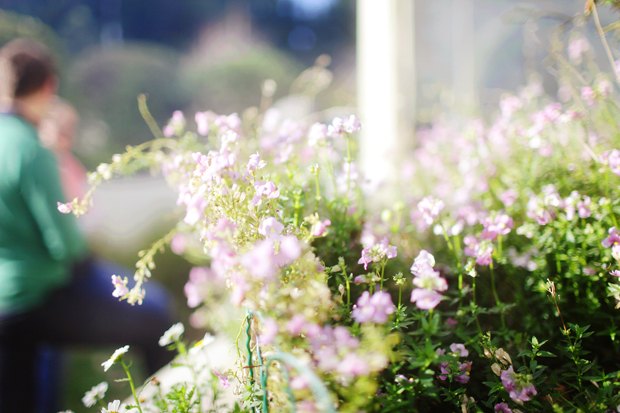 It looks like you had a beautiful day. I’m going to be hunting down those fondant vegetables myself! I love Eleanor’s dress … I hope my Aunt will get out her smocking machine again when my kids come along. This looks like a picture perfect party and I am sure you all had fun, even if you all were a little exhausted afterwards. 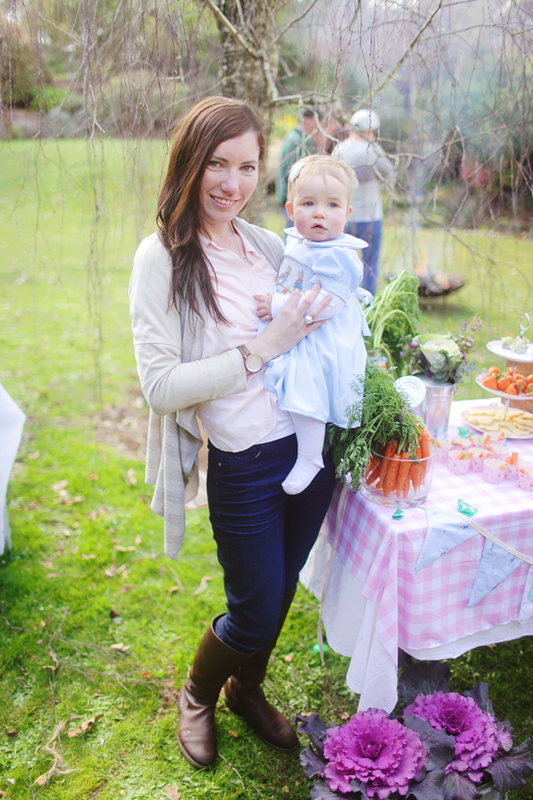 I love the Peter Rabbit print fabrics from Spotlight too. I have used them to make bunny rugs/ blankets for babies. Me too! I actually stayed away from the pink types as I preferred the ‘traditional’ Peter Rabbit blues. I have some of the Bambi fabric too that I want to make some things for Eleanor with. I’ve never seen/heard of a smocking machine? Mum did it all by hand! And sewed the dress altogether the day before! Eleanor is so cute!! You did a fab job, everything looks amazing!